THE key to unlocking All-Ireland Intermediate success for Tyrone ladies this Sunday could lie with the strength in depth of the panel as they look to make a long-awaited return to senior championship ranks for 2019. The Ulster champions face Meath in the intermediate decider at Croke Park in the second of a triple header at GAA Headquarters on Ladies Finals Day (1.45pm). They were here 12 months ago facing Tipperary but it just didn't happen for the Red Hands on the day and in the end three points separated the sides, 1-13 to 1-10. Now Gerry Moane's side are back in another battle to get their hands on the Mary Quinn Cup. Moane has used 29 players during this year's intermediate championship - both provincial and All-Ireland - as they have come through their six games undefeated. 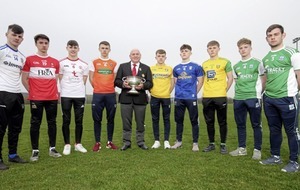 Only three players - captain Neamh Woods at midfield and wing half backs Slaine McCarroll and Emma Brennan, sister of Tyrone senior men's duo Rory and Lee, have started each game. That statistic is enough to indicate the huge strength in depth this Tyrone team possesses and the weekly fight for places as 30 plus players look for a place in the match day squad and fight it out for the 15 starting jerseys. Two players who know only too well about the competition for places are Christiane Hunter and Emma Hegarty. Both are experienced members of the squad - Hunter having made her county debut back in 2007 and Hegarty a little more recently, but still some seven years ago back in 2011 - and both know that with with all that experience, starting places are never guaranteed such is the talent of the whole squad. Hunter was in and out for Tyrone during their Division Two national league campaign. Her PGCE studies in Carlisle meant she could not fully commit but travelled home as regularly as she could for games and trainings. However, she has been back home since April and thrown herself 100 per cent in the cause and has now been rewarded with starts in their last three games after two substitute appearances in the Ulster final against Down and the first qualifying game against Wicklow. But the Omagh St Enda's player is taking nothing for granted and hopes she has shown enough fight in their dramatic semi-final win over Sligo and since then to keep her place in the Tyrone starting line-up, where she has played at both centre half back and corner back, for Sunday. "People are killing themselves trying to get a jersey on this team and it must be difficult enough for the managers to choose 30 let alone the starting 15 so everybody is going to want to have a starting 15 jersey on their back for the All-Ireland final but obviously some people are unfortunately going to lose out," said Hunter. "In a way it’s brilliant to see as in years gone by we didn’t have the luxury of having over 30 players at training and didn’t have that fight for a jersey so it can only be a positive thing." Forward Emma Hegarty started all of Tyrone's national league games, but she has found herself having to prepare for her side's championship games mostly from the bench. However, with four substitute appearances in six games, with one game seeing her start - against Offaly in the final qualifying game - manager Moane knows he can rely on the Donaghmore club player's impact from the bench. That has seen her score 1-1, a point in the Ulster final against Down and a goal against Offaly and although she admits it is disappointing not to start a game for your county, she is ready for Moane's nod from the sidelines. "The competition in this team for starting places is unreal and you just don’t know when you will be playing or not and you have to prepare as best you can," said the 27-year-old. "This year has been similar to last year in that I started all of the league and just when championship comes sometimes you are unfortunate and just miss out on that place, but I have been lucky enough to be one of the reinforcements coming on in most of the games. “It is very disappointing when the team is named and you find out you are not starting but it’s just one of those things that comes with football. "At the end of the day you are sitting in an All-Ireland final and it is because of the strength and the depth of the team and sometimes you have just have to take it on the chin and move on and hope that you can make that positive contribution whenever you do come on,” she added. Hegarty, who came on as a sub in the final last year, feels too that the difference in the squad between this year and last year is the fact they haven't been talking about reaching Croke Park but instead winning an All-Ireland. "When we talk about the maturity end of things, this year our focus is about winning whereas last year, Croke Park was a complete novelty and I do think for the first 20 or 25 minutes it did take over. "Now it is a different mindset and I think going in to the game it will give us that edge as Meath are in the position now that we were in last year and Croke Park is a big thing and a big issue which hopefully we can forget about this year. "There are no second chances and last year after the final whistle had gone and as amazing as it is to play in Croke Park when you are on the wrong end of it, it is the loneliest place to be. "The scenes of devastation in the changing room last year were awful and nobody really could console each other. "We have been training very very hard so for all that effort to be put to waste again it would tear girls apart. With the strength in that squad if Tyrone go out on Sunday and get beat it will be our own doing. "Destiny is in our hands as far as we are concerned."